Last Wednesday’s ride was another longer one, up to campus for a mid-morning meeting, and then back to Patapsco Valley State Park, this time to find a trail inside the park, unlike Monday’s ride. A teensy bit of advanced planning can do wonders, but that’s not a lesson I seem able to learn. I also failed to learn the lesson that the GPS is not always right, so my ride out of campus led me, for a disturbingly long time, out on the shoulder of I195. It’s UMBC Boulevard for a hot minute, and then there’s allegedly a way to stay on that street and then take a ramp up to Selford. I’ve seen our cross country team coming back from this direction, so I’m sure that’s possible, but I couldn’t figure it out. So there I was, riding out toward the I95 on ramp, shaking my head, saying out loud to myself, “This can’t be right. This can’t be right.” I did a couple of passes and then gave up, figuring my sense of safety was worth taking the long way around. And then I did, up the hill that puts UMBC at 1000 Hilltop Circle, and then out, a left on Wilkens to Rolling Road and then a right on the spectacularly beautiful Gun Road–all downhill into the woods. I climbed around the gates at the CSX tracks and was in the park. It only took a few wrong turns and a chat with a ranger to find the trail, which I rode up in heavy air, about ready to let loose an afternoon rain. It eventually did, and I tucked under a bathroom overhang to wait it out. I ate a banana, looked at some maps, and felt generally like it was the greatest day in the history of the world. I snapped this picture on a bridge at the end of the trail–what a view. I cropped out the lovebirds making out in the water below, and the other cyclists, some of whom returned my big smiles, others keeping their heads down–they’ve got a different sort of project going on. I took the long way home, letting the GPS take me through Catonsville neighborhoods and up Catonsville hills that I’d never seen, and eventually I was out on Caton Avenue again, a left onto Wilkens, back the way I came. What a great way to end a work meeting. 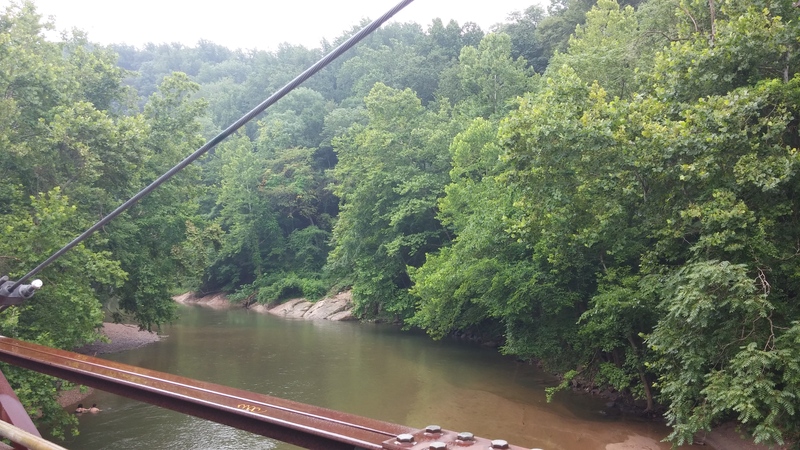 This entry was posted in parks and tagged Catonsville, commuting, Patapsco Valley State Park, UMBC. Bookmark the permalink.